We’re moving into a new era of regulation and compliance that will be driven by new technology. Most of our listeners know I’ve co-founded a regtech firm, Hummingbird, to help bring this new model, first, to anti-money laundering, which is widely seen as the arena where the old compliance model is most broken, and where new technology could go the farthest, fastest, to solve everyone’s problems -- by both improving outcomes and cutting costs. There is a growing global “regtech” community, in both the public and private sectors, aiming to transform financial regulation and compliance, and specifically to make them both digitally-native, with all the power of digitization to make everything better, faster, and cheaper, all at once. Executing this transformation will take imagination, vision, wisdom and even courage, which is why I invited today’s guest to join us. He is Jim Richards, founder of the new firm, RegTech Consulting, and I think he used the word “courage” six times, in our talk. We sat down together at this year’s LendIt conference in San Francisco, just a few days after Jim had retired from his position as the Bank Secrecy Act Officer and Global Head of Financial Crimes Risk management at Wells Fargo, a job he held for more than twelve years. He’s also an attorney and a deep expert in financial crime. Jim is famously outspoken. He’s also funny (he says the book he wrote on transnational financial crime sold more copies in Russian than in English. Most of all, though, he’s frustrated. He thinks we can do better in fighting financial crime. I do too. According to the United Nations, there’s about $2 trillion in global financial crime each year, and we’re catching less than 1 percent of it. To achieve these paltry results, the financial industry spends around $50 billion a year. In other words, launderers can fund terrorism and amass wealth by trafficking in drugs, weapons, and human beings, with very little risk of getting caught. No wonder financial crime is a growing global business. Jim says that the heart of this problem is that incentives are misaligned, which means resources are too. He thinks we’ve built a regulatory system that does not reward effectiveness but instead prizes compliance “hygiene.” The theory of the system, of course, is that banks’ careful compliance with the AML regulations should lead to high levels of effectiveness in helping law enforcement stop financial crime. Possibly, in an earlier era, it did. Today, though, there is a massive mismatch between the compliance activities required by our regulations and the desired outcomes -- partly because the technology of both money laundering, and anti-money laundering, has shifted under our feet. And today’s methods can’t scale up. Like many people in the AML world -- including me -- Jim envisions a better system in which, mostly through newer technology, we could take some of the thousands of people and billions of dollars devoted to this effort and redirect them to drive better results, and cut the costs, too. He has lots of ideas. They include updating the rules on Currency Transaction Reports; fixing the Know Your Customer process through more information standardization, prescreening, and data sharing; addressing the new beneficial ownership requirements (which he calls a tsunami hitting banks and their small business customers; and resolving what he calls “The Clash of the Titles” -- the four titles of the US Code that govern financial crime. He suggests getting law enforcement input into financial regulators’ enforcement efforts. He has thoughts on how AML and fraud detection overlap and differ. He says there’s a lot to learn from how fintech companies do AML since they generally have good data and new systems. 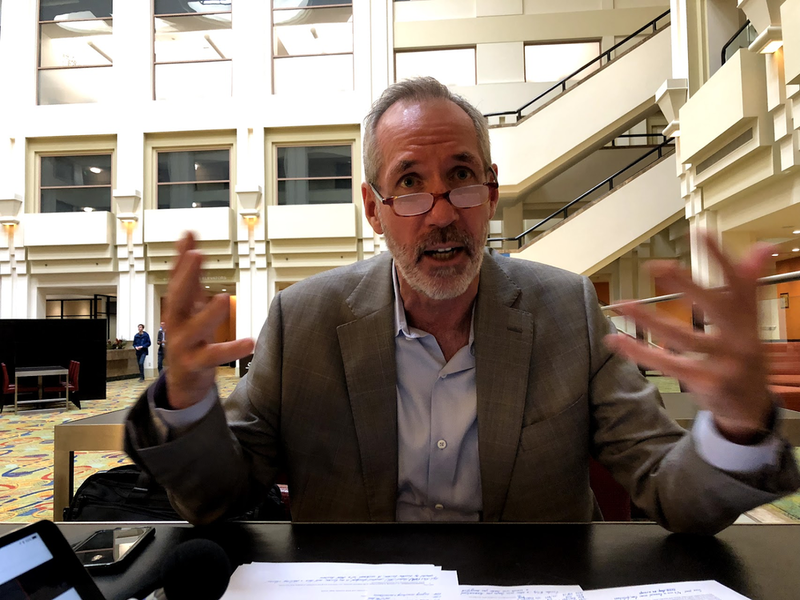 Like our previous Barefoot Innovation guest, Ripple’s Chris Larsen, Jim sees a useful model in how global trade was transformed by the advent of standardized shipping containers, as explained in Marc Levinson’s book, The Box. A key issue is transaction monitoring (although Jim vigorously argues that term is obsolete). The law requires banks to monitor their customers’ activity and report suspicious patterns. Today, this process, systemwide, produces huge over-reporting of meaningless alerts that drown both bank personnel and law enforcement in low-value information they don’t have the tools to analyze. It’s a perfect use case for AI, which Jim says Wells Fargo began using in AML as early as 2008 and is now building further under his successor, Graham Bailey (whom Jim calls a genius, the best AML technologist in the industry). Jim says that banks like Wells Fargo devote less than ten percent of their AML compliance people to working on sophisticated, complex crime, while the other 90+ percent do regulatory compliance, just “crunching through the volumes.” This is at a time when the crime itself is getting more and more sophisticated because the worst criminals are adopting new tech and are building global networks, most of which we can’t find with current methods. He makes the case that it would be good to flip that and deck the 90 percent against the big problems. We already have the technology to do that, both in process and analytics. We just need to enable the system to adopt it, for both government and industry. The original AML law in the United States, the Bank Secrecy Act, is approaching the half-century mark. It’s been modernized and automated along the way -- FinCEN has brought in a lot of automation -- but the system doesn’t yet leverage the newest technology. It needs to shift to digitally-native design, probably with open source technology that can enable new, efficient, effective approaches, system-wide. A few weeks after we recorded this episode, I hosted a roundtable in Washington where experts from across the AML ecosystem -- large and small banks, fintechs, regtechs, bank regulators, trade groups, Congressional staff, academics and, crucially, law enforcement -- spent a day together thinking through next-generation AML. The new Comptroller of the Currency, Joseph Otting, has made AML modernization a top priority. Change is coming. And it’s attracting great people, including great tech people, into solving these problems, including many who, a year ago, would surely have laughed to hear Jim Richards say, as he did to me, that BSA Officer is “the most fascinating job you can have in banking.” People think compliance is boring. They’re wrong. It’s fascinating, and it’s important. Jim has founded his new firm, RegTech Advisors, to, as he puts it, “develop the next generation of professionals, technologies, programs, and regimes and really make a difference.” He thinks doing that will take courage... including the courage to make some mistakes. That’s a type of courage that doesn’t come easily to the regulatory sector, but we’re going to have to develop it. Jim Richards is Principal and Founder of RegTech Consulting, LLC, a private consultancy aimed at developing the next generation of BSA/AML and financial crimes professionals, technologies, and programs. Services include BSA Officer coaching, program reviews, crisis management, director support, non-financial institution development and awareness, and FinTech due diligence. From 2005 to April 2018 Jim was BSA Officer, Global Head of Financial Crimes Risk Management, Wells Fargo & Co., where he was responsible for governance and program oversight of Bank Secrecy Act and AML for Wells Fargo’s global operations, including quarterly reporting to the Board of Directors. As Director of the Global Financial Crimes Risk Management group, Jim oversaw governance and program execution of BSA, AML, External Fraud, Global Sanctions, Financial Crimes Analytics, and High-Risk Customer Due Diligence. He was a member of the Wells Fargo Management Committee and Enterprise Risk Management Committee, and he represented Wells Fargo with the Bank Secrecy Act Advisory Group (BSAAG) of the US Department of the Treasury. Jim previously held AML and financial intelligence positions at Bank of America and FleetBoston. He was also an Assistant District Attorney, Special Investigations Unit, Middlesex County District Attorney’s Office, in Cambridge, MA, investigating and prosecuting cases involving narcotics, organized crime, white-collar crime, and economic crime in the largest county in Massachusetts. Investigations and prosecutions included felony embezzlement, attorney fraud, public corruption, computer-based larceny, gambling, money laundering, and organized gambling cases. He was Supervisor of the SIU’s Narcotics Forfeiture Group, with carriage of and supervision over the Group’s civil and criminal forfeiture caseload. Jim has prior experience in private legal practice at Choate, Hall & Stewart in Boston, as a Barrister in Ontario, Canada, and as Special Constable, Royal Canadian Mounted Police, E Division (British Columbia). We have great shows in the queue. We’ll talk with the CEO’s of two community banks -- Bob Rivers of Eastern Bank and Mike Butler of Radius Bank, both of which are leading the way in innovation by smaller institutions. We’ll also have two more I recorded at LendIt. One is a discussion of new research undertaken jointly by LendUp and Experian, on how to improve financial access through credit reporting. The other is with my friend Greg Kidd of Global ID. I’m pleased to say we also will have several members of Congress in the coming weeks, and also several guests I’ll record at the upcoming, global AML tech sprint being run by the UK Financial Conduct Authority. Money 2020, October in Las Vegas where, among other things, I’ll be speaking on the Revolution Stage about the revolution in...what else? Regulation. As always, please remember to review Barefoot Innovation on iTunes, and sign up to get emails that bring you the newest podcast, newsletter, and blog posts, at jsbarefoot.com. Again, follow me on twitter and facebook. And please send in your “buck a show” to keep Barefoot Innovation going!